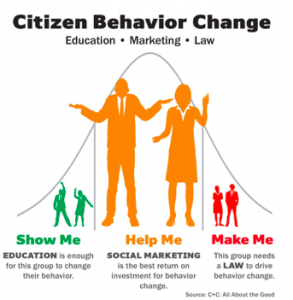 When it comes to influencing citizen behavior change for social good, policymakers, agency directors and program managers typically begin with an education campaign, one that relies primarily on words to influence behavior adoption (Buckle Up. We Love You.). When this effort results in disappointing outcomes, even after years of promotion, a law is often proposed, passed and enforced (Click It Or Ticket), typically one with fines. This PA TIMES column is to encourage consideration of a third option, social marketing, one that is often the most effective and efficient in achieving high rates of behavior change, and, importantly, also one that can achieve the greatest return on investment of resources. For increasing seatbelt usage, that familiar sound (Ding. Ding. Ding.) reminding us to buckle up would be an example of a social marketing approach. Let’s consider pet waste to illustrate these distinctions in more detail. 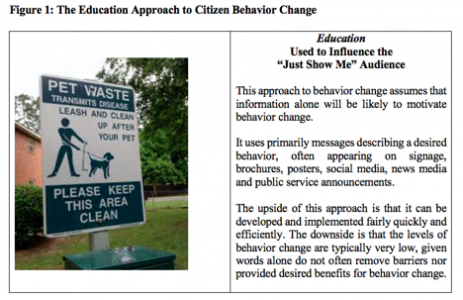 Early efforts to encourage pet owners to pick up their pet’s waste most commonly involved creating signs and placing them in parks and public places, ones providing simple instructions and sometimes mentioning environmental benefits (See Figure 1). 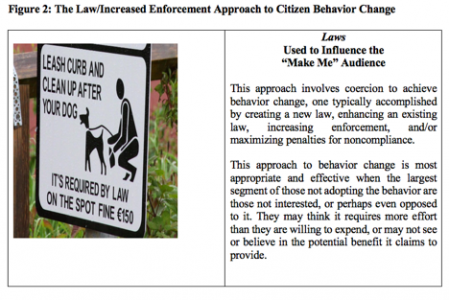 When these efforts did not achieve significant behavior change outcomes, agencies turned to laws, fines and enforcement, emphasizing consequences for noncompliance (See Figure 2). 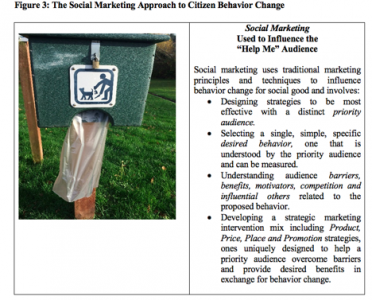 In many communities, still frustrated with disappointing behavior change levels and accumulations of pet waste in parks and other public spaces, a third option was tried, one designed to help the citizens pick up after their pet by overcoming barriers such as not having a plastic bag and/or a convenient trash container to dispose of it (See Figure 3). Improve Health: Opioid overdose, Tobacco use, Alcohol abuse, Teen pregnancy, Obesity, HIV/AIDS, Fruit and vegetable intake, Breastfeeding, Breast cancer, Colon cancer, Immunizations, Eating disorders, Anemia, Polio, Tuberculosis, Malaria. Prevent Injuries: Youth suicide, Domestic violence, Gun storage, School violence, Senior falls, Household poisons, Head injuries, Pedestrian injuries, Alcohol-related crashes. Protect the Environment: Recycling, Composting, Natural yard care, Wildfires, Littering, Water conservation, Wildlife habitat protection, Alternative yransportation, Energy conservation, Forest restoration. Engage Communities: Homelessness, Organ donation, Blood donation, Voting, Animal adoption, Crime prevention, Mentoring, Volunteering. Impact Academic Performance: Literacy, High school graduation, College applications, Tutoring. Enhance Financial Well Being: Checking accounts for the unbanked, Retirement savings, Mobile banking, Identity theft, Fraud. Three future PA Times columns that I will write in 2019 will discuss in-depth success stories for each of these social issues, presenting the Problem, Social Marketing Solution, and Results.